The Revision Desert Locust Asian Fit Goggles have been redesigned to more closely fit Asian facial profiles. The low profile features insures compatibility with helmets, weapon sights, binoculars, and night vision equipment. 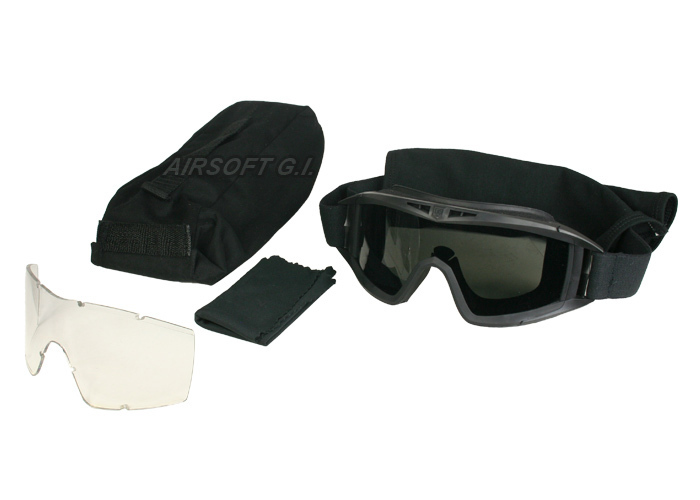 The goggles have been tested and certified to military requirements for high impact protection. The optically correct lens provides a wide field of view and protection from UV rays. Top and lateral forced air vents provide airflow while filtration media prevents small particles from entering. The high performance OcuMax coating gives enhanced protection from fogging and scratching. All these features combine to make these goggles very comfortable and functional. These goggles are wounderfull, the caring case has a belt loop, and the goggles has a "Sock" for protacting the goggles when not in use, the lens's are a trick to swich, but they're wounder full. The Army issues these things out, and I still have mine from basic, and I've seen photos of what happens when they've been shot by a 12 gage, and I trust them with the safety of my eyes. Sock for protecting the lens. works well with Combat helmets. Tinted lens is great for day time use. after prolong use, the top of the goggles tend to make fore head sore. May cause wearer to get abit sweaty due to prolong use in hot weather. Solvent: take short breaks to wet your face, and cool down, and take goggles off for alittle bit. do these fit with glasses? Asian fit means that the fit of the goggles is for a flatter face profile, with a lower nose bridge.